Illustration courtesy of LaCrosse Footwear. As I planned my May 2010 trip to Alaska for a black bear hunt, I did my best to keep additional costs to a minimum. On any trip a hunter makes to a new or different area, he or she needs to be sure the equipment is matched to the typical conditions found there. This, of course, is coupled with the pressure to keep costs low (unless you are a well-heeled hunter, anyway). With these thoughts in mind, I kept my new purchases to a minimum while planning my 10-day Alaskan foray. Much has been written about Alaskan weather, especially in the southeastern and south central areas, due to the wet weather associated those areas. Anyone familiar with Alaska and its weather patterns will tell a newbie traveler or hunter to bring good wet weather gear, including the best rain gear you can find and good waterproof footwear. I had two excellent rain parkas suitable for cool to cold weather wear, dependent on how I layered underneath them. I also needed some waterproof bottoms (pants) that were breathable. I already had some decent waterproof bottoms, but they were not the breathable type. The other item I knew I sorely needed was a quality pair of waterproof boots that would be suitable for a good bit of walking in terrain that varied from sloppy to sloppier. As a fan of lightweight footwear, I knew I had some important choices to make regarding comfort vs. effectiveness. I managed to get a couple of very educated opinions (thank you R.K. and Mike) and I tried to couple both opinions into one pair of boots. One of these suggestions was for about a 16" tall pair of rubber boots that fit well and allowed comfortable walking and hiking. The other was to bring and wear hip waders (gasp!). I considered the hip wader suggestion for perhaps 30 seconds before deciding against it and made the decision to find a comfortable pair of waterproof boots suitable for walking mile after mile in the Alaskan bush. I believe I did very well with my choice. The LaCrosse Alpha Lite 5mm boots I purchased were about as perfect a choice as I could have made. They did everything I asked of them and did it without any extended break-in before my first two-mile walk through the lowlands adjacent to the base lodge. For the record, this lodge/base camp was about 100 miles from the nearest road and was accessed only by floatplane. It was located on a small lake, as close to the foothills of the Alaskan Range as possible while affording barely enough room to land a floatplane. Once in camp, it was a $1,000 (per person) fee to make another round trip. Bring everything you need on your trip in! My initial walk at 4:30 AM the first morning I awoke in Alaska showed me I had done well. Al, my hunting partner, and I walked a trail that followed the stream flowing out of the lake to where it flowed into the Kichatna River. We encountered ground that varied from firm to snow covered to swampy on our first Alaskan hike. The lake had experienced ice-out exactly one week before our May 27 arrival in camp, so the water was cold. The LaCrosse Alpha Light 5 mm boots that I wore 80% of the time over the next nine days worked great. The air temperatures in our spike camp varied from right at freezing to a high of 75-degrees or so. There was no artificial heat for our 8'x8' tent and we had to keep ourselves warm for the eight nights spent in spike camp. I had another pair of boots with me, some nine-inch, waterproof, leather/Cordura boots that I wore in conjunction with 20" waterproof gaiters. These boots were lighter and more comfortable than the LaCrosse boots, but at a price of "true" waterproof-ness. They worked fine for the half days I wore them while our weather stayed dry and warm during midday. However, when the weather turned relentlessly rainy and chilly, there was no way to dry them and the LaCrosse footwear proved their mettle during those last three rainy days in the spike camp. If they had leaked at all, I would have been miserable, as another hunter's hip boots did on the day last. Instead, the Alpha Light's maintained perfect waterproof integrity and held up without a hiccup when we chose to ride the ATVs a few miles out of camp to try new hunting areas. Shifting and constant contact with the hot engine never left so much as an abrasion or mark on the Alpha Lights. I'm not going to claim that several months worth of the abuse I gave them would not have compromised the rubber/neoprene construction of the boots, but I sure never saw any hint of a problem after 10 days of walking and wading in water from 2" to 18" in depth. 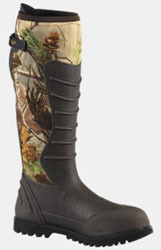 Someone who wades creeks and rides ATVs every day, needing the same protection I sought, would perhaps be prudent to purchase a pair of $300 Le Chameau boots, but this is not what I was looking for when I started searching for a good pair of comfortable, waterproof boots. What I got was an affordable pair of waterproof boots that needed no break-in, were comfortable to walk several miles and kept my feet warm and dry in temperatures varying from the low 30's to mid 70's. While doing so, they held up to the additional stress that riding an ATV through rough, wet terrain put on them. That's a good bit to ask of any pair of boots and when you find a pair that can and does do all of that for under $100, you have done well! These boots will get a lot of wear during the upcoming deer, bear and hog seasons in Maine, Tennessee, Kentucky and Georgia, especially on the swampy ground we normally hunt in both Georgia and Kentucky. I am even more anxious than normal for those seasons to get underway now! When and if these boots wear out, they will more than likely be replaced by another identical pair. What better recommendation can I give them? Copyright 2010, 2013 by Ed Turner and/or chuckhawks.com. All rights reserved.